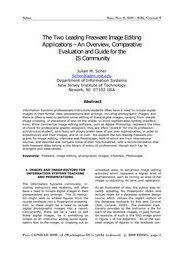 Recommended Citation: Scher, J M. The Two Leading Freeware Image Editing Applications – An Overview, Comparative Evaluation and Guide for the IS Community. In The Proceedings of the Conference on Information Systems Applied Research 2009, v 2 (Washington DC): §4134. ISSN: 0000-0000. Information Systems professionals/instructors/students often have a need to include digital images in their formal class presentations and writings, including photographic images, and there is often a need to perform some editing of these digital images, ranging from simple image cropping, or placement of text on the image, to more sophisticated lighting modifications. While commercial image editing software, such as Adobe Photoshop, represent the titles of choice for professional graphic designers, they are often “overkill” for the IS professional/instructor/student, who likely will simply prefer ease of use over sophistication, in order to expeditiously edit their images, and at nil cost. We explore the two leading freeware programs for image editing, Irfanview and Photoscape, both of which are from international sources, and describe and compare some of their functionalities, with a recommendation that both freeware titles belong in the library of every IS professional, though each has its strengths and weaknesses.